More than 3,000 Yemeni women held a protest rally in the capital Sanaa against exiled president Mansour Hadi and Saudi Arabia’s ongoing military onslaught to reinstate his rule. The women, mostly dressed in black niqabs and carrying weapons, chanted as they marched to upbeat music. Missile launchers, machine guns were among the weapons brandished at the event. 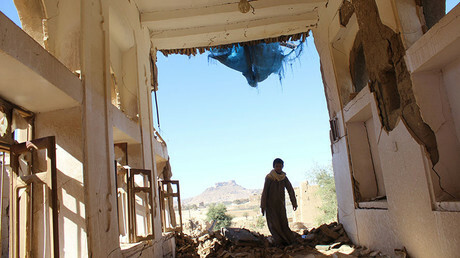 Yemen is suffering a humanitarian crisis as the two year conflict continues between a Saudi-led pro-government coalition and the Houthi rebels who forced President Abdrabbuh Mansour Hadi to flee the country in 2015. People of Yemen are at the brink of famine, with food and aid supplies cut off. UN estimates that at 10,000 casualties, mostly civilian, have occurred since March 2015, when Saudi Arabia began bombing the country to prevent the rebels from taking control of the entire country. The Kingdom leads the Arab coalition that supports President Hadi, who fled Yemen in February 2015, while the Houthis support former President Ali Abdullah Saleh, who agreed to transfer power to Hadi in 2012, for a two year term. Hadi extended his term in 2014 and was criticized for failing to deliver on his promise to bring change and manage issues facing the country. The US and the UK have provided support to the Saudi-led coalition, both in terms of weapons and tactical assistance, despite reports of civilian deaths and war crimes. “As one of the principal backers of this brutal war, Britain needs to end its arms sales and military support to the Saudis and help put Yemen on the road to peace,” Oxfam GB chief executive, Mark Goldring said in December. All-women protests against Saudi Arabia are common in Yemen. In October 2015, women condemned the UN for failing to address the attacks which killed women and children. In June 2015, women gathered outside the attorney-general’s office in Sanaa demanding Hadi and his government be prosecuted. “Families of the martyrs of the Saudi aggression demand the trial of the collaborators and traitors," signs carried by the women read. The UN envoy to Yemen, Ismail Ould Chiekh Ahmed arrived in Yemen on Monday and meet with Hadi in Aden to discuss a proposed roadmap for peace, after Hadi had rejected an earlier proposal that would see a new vice-president step in before new elections were held. “A peace agreement, including a well articulated security plan and the formation of an inclusive government is the only way to end the war that has fueled the development of terrorism in Yemen and the region. I asked the President to act swiftly and engage constructively with the UN’s proposal for the sake of the country’s future," Chiekh Ahmed said.